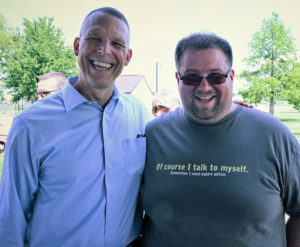 Congressman Scott Perry is the number one conservative congressman from Pennsylvania and one of the top conservatives in the House of Representatives, according to Heritage Action for America, which gave him a 100% rating. He was given the “Statesman of the Year” Award by the Conservative Christian Center at a York, PA Breakfast in 2017. On virtually every issue of concern to conservatives, Congressman Perry, who is also an active duty U.S. Army Reserve General, has not only voted right but has articulated conservative views, often with appearances on Fox TV and other media outlets. Ron Cohen will be the “Master of Ceremonies” during the three hours long gathering, at which Congressmen are asked to visit at any time (or their senior staff) to listen to a 3 minute presentation, make their own remarks for 3 minutes and then, if they have time, to take 3 minutes question and answer, and pose for a group photo with the visitors (1 minute). Cohen is a member of the Retired Military Officers Advisory Board of Uniformed Services League. Congressmen and Senators received an 8 page packet personally addressed to them inviting them to attend the Tuesday briefing, hand delivered this past Thursday. Congressmen Perry and Gohmert responded almost immediately, with Hunter having already indicated he will attend after he had been the original room sponsor for the event. Congressman Perry will join the group for lunch, which is prepared sandwiches (boxed lunch) between 12 and 1 PM (all Congressmen are invited and may bring 1 staff member). Perry is seeking reelection to Congress in a south central, Pennsylvania district which the Democrat dominated State Supreme Court has gerrymandered to give a better chance of having a Democrat defeat him. They removed strong Republican precincts from his Congressional district and added more Democrat-dominated precincts. This Pennsylvania State Supreme Court redistricting is in complete defiance of the State’s Constitution, which clearly stipulates that the boundary lines of congressional and state legislative seats are to be drawn by the state legislature. But since that’s under the Control of the Republican Party, the Democrat-dominated Supreme Court simply ruled their work unconstitutional and drew new boundary lines, so that conservative Congressmen like Scott Perry might be defeated and Nancy Pelosi restored as House Speaker. Congressman Perry’s reelection campaign can be visited HERE. Perry was the kick off speaker at the recent Pennsylvania Leadership Conference largest annual gathering of conservatives in the keystone state. He was the keynote speaker at the 6th annual Heritage Fiesta summer picnic this past summer, co-sponsored by Conservative Christian Center. It was his 2nd appearance as keynote speaker in their six years. Congressman Duncan Hunter, the host Congressman for the Rayburn House Office Building Hearing Room briefing, is the only Congressman who has been a combat veteran of both Iraq (2 tours) and Afghanistan (1 tour) as a U.S. Marine. He is a candidate for reelection (information HERE). Congressman Louie Gohmert of Texas, is a former U.S. Army Captain and a frequent guest on Fox TV. He is a candidate for reelection in 2018 (more info HERE). United American Patriots and Uniformed Services League hope that at least ten or more Congressmen will visit at any time while they have the room reserved, from 12 noon to 3 PM. At 3 PM they will depart and head to an evening “Restore Freedom Rally” at the Freedom Leadership Conference which is 7:30 to 9 PM. 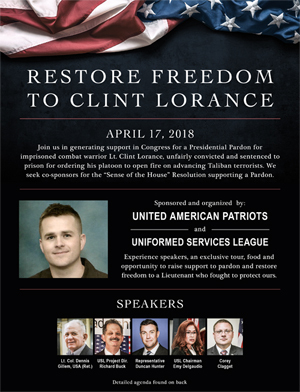 Both United American Patriots and Uniformed Services League will have a minimum of 20 boxes of petitions on hand, supporting a Presidential Pardon for Clint Lorance. The evening conference will be preceded by a small dinner at a local Bob Evans Restaurant in Chantilly close to the hotel meeting site, for those who attended the day-time activity or those who can serve on the Host Committee ($50 donation). Invited guests for the 6 PM dinner and the 7:30 PM conference include the attorney for Clint Lorance, one or more family members of Clint Lorance, and the official spokesman for the two organizations sponsoring the day’s activities, United American Patriots and Uniformed Services League. The spokesmen of each organization who will provide the Congressional briefing during the day and then be the keynote speakers at the evening “Restore Freedom Rally” at the Freedom Leadership Conference are: Lt. Col. Denny Gillem, USA (Ret.) for United American Patriots, and Richard Buck for Uniformed Services League. Gillem has been asked to serve on the board of UAP. Buck has been the USL Project Director and for seven years has been the Event Coordinator of the Freedom Leadership Conference. The SPONSOR of the evening rally and conference is United American Patriots (40 minutes of program time) with Uniformed Services League as CO-SPONSOR (20 minutes program time). If anyone would like a ride to the morning breakfast you need to be at the Comfort Suites Hotel at 6:30 AM promptly for a free ride, and have made your reservation for the custom tour in advance AND RECEIVED A CONFIRMATION BACK by email or phone. The custom tour (led by a member of the staff of Congressman Duncan Hunter) is immediately after breakfast at the House Rayburn Bldg., and ends in time to attend the lunch at the Rayburn committee hearing room. Attendees are strongly urged to carefully read the flyer including the “small print” about the event details and advance registration requirements.